The following was written by PEP volunteer, John Selzer, the Founding Director at Septariate (a company that he was inspired to launch through his involvement with PEP’s aspiring entrepreneurs). I recently had the privilege to attend the Leadership Academy launch event at the Sanders Estes Unit in Venus, the site of PEP’s expansion into North Texas. To me, this day was truly representative of the transformative power of this organization. Our time was spent in what will become the dedicated PEP room. The walls were painted white with fresh primer, awaiting the bright colors to come. The floors were bare concrete, not yet covered in carpet. The Ten Driving Values had not yet been posted in their typically prominent location. It was almost poetic to have that perfectly blank slate. Typically, executive volunteers are not introduced to program participants until the Leadership Academy is completed. What a gift to meet and interact with the Investigators at this stage, most of whom were still struggling with their commitment to the program or whether or not they are “worth it” or “deserve this opportunity”. It was PEP in its more pure and raw form. Throughout the course of the day, the trepidation and uncertainty melted away and you could see – no, feel – the change in the room. It was palpable – and electric. I am not certain if the participants or the executive volunteers were more affected by the experience. I still get chills thinking about it. In the span of only four hours, a room full of skeptical, and still a little wary, participants broke through their doubts and embraced the power of PEP and left with a sense of purpose and a newfound optimism that they can take control of their future. And maybe most importantly, they realized that they do not have to do it alone. 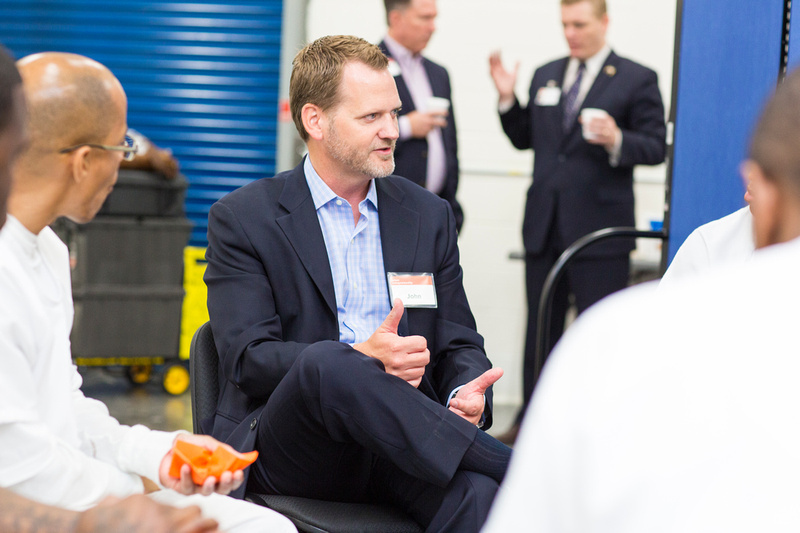 They now have a deep and mutually supportive connection to their brothers in the program and access to a broad network of executive volunteers that are there for them in prison and waiting upon their release. For someone that has never been given anything without strings attached, this is a profound offering. PEP represents an inflexion point in their lives. That day at Sanders Estes, we witnessed the turn and the beginning of the upward slope. That is powerful, and simply transformational, stuff. What an incredible honor to have been a part of it. My experience with PEP has been one of the most meaningful things I have ever done. I leave each event feeling uplifted, hopeful, inspired and introspective. It was during one drive home from Cleveland that I realized that I wanted to divert from my safe and secure career path to take a shot at the entrepreneur life. Although this new chapter in my life is still being drafted, I hope that it affords me the opportunity to employ and mentor PEP graduates in a new way. Regardless, I know that I will continue to be a regular at the Cleveland and Sanders Estes units. I hope to see you in prison.